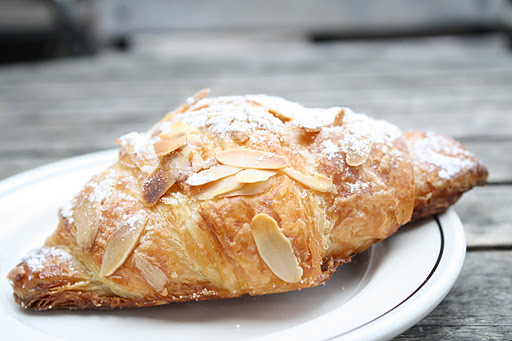 Café Fanny’s perfect almond croissant. In 1971, Alice Waters first made her mark on the culinary map with her acclaimed French bistro, Chez Panisse. She advocates the idea “that cooking should be based on the finest and freshest seasonal ingredients that are produced sustainably and locally.” Alice’s hole-in-the-wall café, affectionately named after her daughter Fanny, Café Fanny is no exception to her trademark philosophy. Alice allows the food to shine, showcasing the ingredients’ natural goodness with simple dishes such as poached farm eggs with vinegar and oregano on thinly-sliced toast. Other favorites include the light buckwheat crepes with homemade preserves and fresh, vibrant pink salmon with crusty rye bread, cream cheese, and pickled onions. The café’s ambience is quintessentially Berkeley: small, rustic, the fragrant aroma of coffee permeating the space. Both for its casual atmosphere and superb food, Café Fanny cannot be missed. Ici’s cherry vanilla rum and chocolate cocoa nib ice cream served atop their organic, hand-rolled cone. Ici Ice Cream shop makes me want to move to Berkeley. Their delicious, seasonal flavors and homemade cones with chocolate-filled tips are the finest I have ever tasted. Like several other Bay area institutions, Ici bases their products on the highest quality, sustainably raised ingredients. From the perfectly round scoops to the elegantly adorn ice cream bombes, every offering on the menu is crafted with extreme attention to detail. The store’s chic decor makes me reminisce of summer afternoons in Paris spent strolling by the Seine with a refreshing ice cream cone in hand. With the clean marble counter, shiny trash cans with gold piping, and the dainty, individually-packaged candies and cookies, Ici brings French sophistication and style to Berkeley. 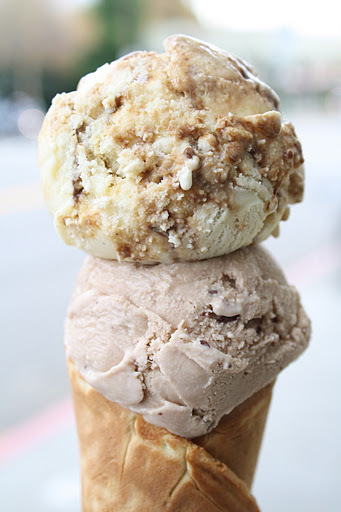 If you have never visited Berkeley, Café Fanny and Ici Ice Cream are two wonderful reasons to plan a trip.